Chiang Rai, area of hill is province where is north of Thailand. It’s old city which has history since “Chiang San” period. 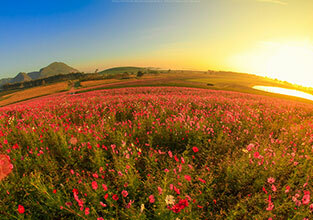 Chiang Rai is area of wetland including with forests on mountain. There are headwater and beautiful waterfall in Chiang Rai. 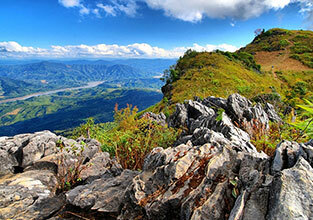 “Pee Pan Num” mountain separates between Thailand & Myanmar and is the first point where Khong river flow pass Thailand. There are many race of people in Chiang Rai. Each race has unique culture which is fascinating and attraction for Thai people and foreigner. “Phu Chi Fa” is highest hilltop in “Doi Pha Mon” mountain. This park is located in the National Forest where unique natural is carp cliff. Cliff path points to the sky that is name “Phu Chi Fa”. Highlight of this park is Viewpoint Sea of mist, beautiful sunrise and panoramic views of the mountains. In the morning, sea of mist cover valley. Sun rise through the mist. The ground is among the prairie and wind flower. This place is 1635 meter above sea level. It’s far from Phu Chi Fa 30 km. It’s located of Chinese village. 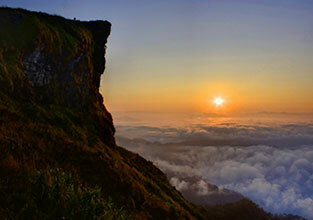 The beauty of Doi Pha Tang is viewpoint to see sea of fog in the morning and see sunset in evening. Tourist can see big orange sun down pass the cloud slowly. Period 31 Dec to Jan in every year is festival, seeing sea of fog and cherry blossom. 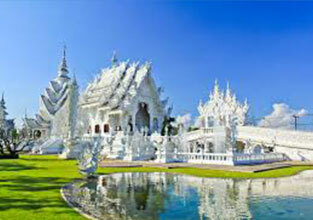 Wat Rong Khun is one of the important religious places. Design and construct by Arjarn Chalermchai Kosidpipat who is Thai painter has many painting work. He was regared as National Artist Visual Arts (Painting) in 2011. He sacrifice to Buddha with the intention to create a magnificent temple is a fairyland. The people can touch fairyland on the planet. It’s like thing to awaken people practice the dharma. 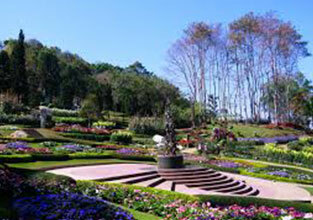 Doi Tung Royal Villa is lived of Queen of Thailand for working. This Villa is 2nd floor building. It combine between Lanna art and Swiss Chalet. It carve wood by Calais. Eaves and window edge is patterns by north Craftsman. Rai BoodRowd belong with Boonrawd Brewery Co., Ltd., where produce Singha beer. It’s a new Agro-tourist attraction. Not only there are plots for cropping Barley inside of Rai BoodRowd, It has 600 agricultural lands and tea plantation. It can see beautiful view of north valley; see sunset and delicious food at Phu Pirom Restaurant. this restaurant you can see panorama on topview. There are bekery & coffee shop in the front of Rai BoodRowd. Recommend for tourist taste tea, wine and tomato at Rai Boonrowd’s product shop.